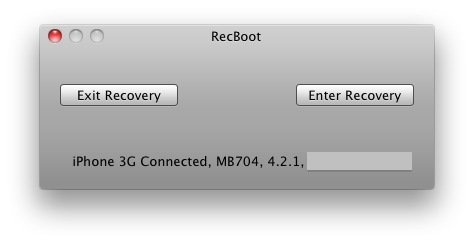 RecBoot is a great tool for Mac OS X that allows you to easily enter and exit iPhone recovery mode without manually holding down any of the buttons. Using the app is extraordinarily simple, you just connect your iOS device to your Mac, launch RecBoot, and click on either “Exit Recovery” or “Enter Recovery” to accomplish either task. The latest version of RecBoot is v 2.1, you can grab it from here (direct download link). RecBoot requires Mac OS X 10.6 or later, and will work with iPhone, iPod touch, and iPad. Remember that recovery mode is different from DFU mode, and RecBoot will not exit from DFU. I thought it wouldnt work, but its fast and very effective. I am very pleased with its results.